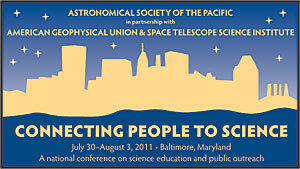 Women in Planetary Science is going to ASP 2011! We’re going to ASP 2011! Fifty-one interviews with women in planetary science are now available as a teaching resource on WomeninPlanetaryScience com. Women in Planetary Science was founded in 2008 to connect communities of current and prospective scientists, to amplify discussions of career progress of women, and to stimulate discussion in the planetary science community at large with frequent provocative essays by a dozen collaborators. Interviews covering career path, achievements, and advice for prospective scientists fill an often-overlooked gap in the movement to encourage young women in science. Although women now earn substantial numbers of bachelor’s degrees in Earth Science (30%), Astronomy (30%), and Physics (17%), the number of women in research and teaching positions rapidly diminishes to less than 7% of full professors in the physical sciences. As a result, many students have never even met a female science professor. The latest AAS survey showed 17% of top Astronomy departments had no female professors at all; no department had more than three. To increase student exposure to successful female role models at all levels of academe, government, research institutions, and industry, new interviews were published weekly and archived on a web site regularly promoted through social media including an active Twitter account, Facebook page, Pinterest pins, and RSS feed. Interaction in all those venues is encouraged; there is ample opportunity for readers to comment or contribute their own essays, ideas, and questions in a Web 3.0 model. Both readers and collaborators span a range of ages and employment scenarios. The 51 Women in Planetary Science interviews are a standing resource, with additional e-mentoring available through the blog, Twitter, Facebook, and Pinterest, where we have just begun crowdsourcing images and links for all women in planetary science. Work was partially supported by NASA Outreach Supplement to Contract NNH08CC65C. Find us at http://womeninplanetaryscience.com. Are you going to ASP 2011? Leave a comment or tweet us @womenplanetsci — We’ll see you there!